John Joseph Adams/Mariner Books, 9781328710260, 368pp. Victorian London is a place of fluid social roles, vibrant arts culture, fin-de-siècle wonders . . . and dangerous underground diabolic cults. Fencer Evadne Gray cares for none of the former and knows nothing of the latter when she’s sent to London to chaperone her younger sister, aspiring art critic Dorina. At loose ends after Dorina becomes enamored with their uncle’s friend, Lady Henrietta “Henry” Wotton, a local aristocrat and aesthete, Evadne enrolls in a fencing school. There, she meets George Cantrell, an experienced fencing master like she’s always dreamed of studying under. But soon, George shows her something more than fancy footwork—he reveals to Evadne a secret, hidden world of devilish demons and their obedient servants. George has dedicated himself to eradicating demons and diabolists alike, and now he needs Evadne’s help. But as she learns more, Evadne begins to believe that Lady Henry might actually be a diabolist . . . and even worse, she suspects Dorina might have become one too. Combining swordplay, the supernatural, and Victorian high society, Creatures of Will and Temper reveals a familiar but strange London in a riff on Oscar Wilde’s The Picture of Dorian Gray that readers won't soon forget. 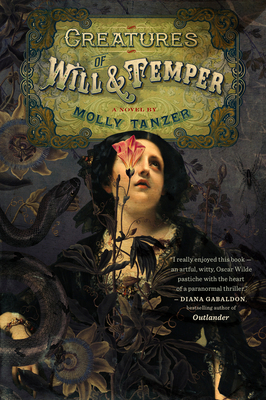 MOLLY TANZER is the Sydney J. Bounds and Wonderland Book Award–nominated author of Vermilion (an NPR and io9 Best Book of 2015), A Pretty Mouth, the historical crime novel The Pleasure Merchant, and other works. She lives in Boulder, Colorado.